We leave our hotel shortly after eight under a gray sky, the sun only a weak spot in the murkiness. The water in the bay appears a darker gray, the docks black. On our way, I gaze out of the bus window, just seeing what I can see. We pass by apple and cherry orchards, Traverse Bay off to our left. We roll by birch and pine forests where black squirrels cavort in the trees. I’m surprised to see vineyards this far north and wonder whether the grapes are used for wine. Corn stalks have been cut, leaving stubble in the fields as though it had been shaved. Flocks of seagulls gather on an open field, probing for insects. Lake Michigan is now on our left and blue Lake Charlevoix, the third largest lake in Michigan, on our right. Remaining on Highway 31, we arrive at the resort town of Petoskey. As a boy, Ernest Hemingway spent time at nearby Lake Walloon. Later, based on that experience, he wrote his Nick Adams stories. Soon we arrive at Mackinac City for our ferry trip to Mackinac Island. Once we arrive at the ferry, we realize how freezing cold the wind is, clouds also blocking any heat from the sun. The wind is so icy that it actually hurts. We slip into our heaviest jackets and zip them up to our necks. We pile on to the ferry where it is soon bucking against the wind and whitecaps, leaving a great “rooster’s tail” of water behind us. It plows through the rough water, bumping and bounding, but at least we are out of the wind. Once we land at the island, feeble sunlight peeks through the clouds to give us a few degrees of warmth. The buildings and quaint shops along the shore also shelter us a bit from the bite of the wind. The first sound I hear as I walk along the main street, is the hollow clomping of horse’s hooves, a sound much like that of wooden shoes of dancers back in Holland. As gas powered vehicles are forbidden on the island, all transportation is the old way, horses and carts. This is what makes the island so charming. Horses haul tourists in wagons over a good part of the island, affording them grand vistas. To me, the supreme attraction on the island is its famous Grand Hotel, built in 1887. It’s a long walk to reach it, but well worth the effort. 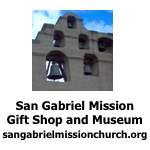 We had visited it on previous trips, but are so glad to see it again. It is a grand white wooden hotel with a turret and a long veranda equipped with white rocking chairs. From the veranda one can sit in comfort and look out at the blue beauty of Lake Michigan. Dolores and I finally reach the hotel, entering its welcome warmth and grandeur. We have to pay ten dollars to tour the hotel, but it’s worth it just to get out of the wind and cold. We stroll through its thick-carpeted halls to a lounge where we relax and look out at the long white porch where American flags flutter in the wind, then Lake Michigan and the distant land beyond. We saunter through the ornate ballroom, a wine bar stocked with books, then up to the cupola bar where we have a 180 degree view of the area. From this lofty place we can see the famous Mackinac Bridge connecting Lower Michigan to the Upper Peninsula, a row of grand old homes to our right, ferry boats cutting through the choppy water of the lake and the lighthouse at the entrance to the island’s harbor. We also look down at the village with all its shops and the forested hills that rise behind it. The Grand Hotel is also noted for the 1980 film “Somewhere in Time” shot entirely at the hotel. The movie captured the imagination and the hearts of millions of people, so much so that a “Somewhere in Time” Fan Club meets at this hotel annually. The film starred Christopher Reeve, Jane Seymour and Christopher Plummer. The 1947 film “This Time for Keeps” starring Esther Williams was also produced here. The swimming pool at the hotel is called the Esther Williams Swimming Pool. We leave the hotel and begin the long walk back to the village, the cold wind unrelenting. A horse and buggy clomps by, a kind of Mackinac taxi. We duck in another hotel to warm up, then slowly make our way to the docks where we will board the ferry for the trip back to the mainland. We stand on the open dock at the mercy of the flag-snapping, bone-chilling wind, enduring the weather for nearly a half hour. I have never been so cold. At last the ferry arrives. We push into it as fast as we can, seeking shelter from the elements. The ferry pounds back across the rough water, spray flying. Back in our comfortable hotel, we relax, then mosey over to a local restaurant where we dine on excellent whitefish. Back at the hotel we have our last view of the lake and the stretch of sand next to us. It is good to be warm again. 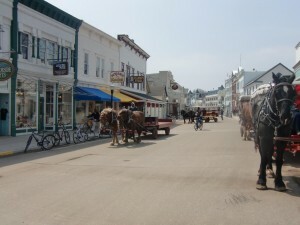 A street scene at the village on Mackinac Island. Note the horses pulling wagons as no cars are allowed on the island. 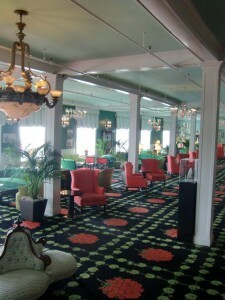 The Grand Hotel on Mackinac Island, built in l887, is a wonder to behold. Inside the hotel, out of the wind, we enjoy a comfortable lounge. 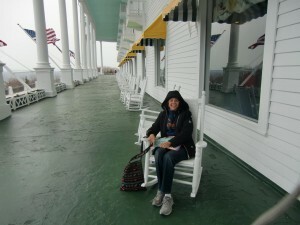 Although the weather is chilly Dolores relaxes on the hotel's famous porch for a brief moment. Note all the rocking chairs. Thanks to Mr Stevens and Dolores Seidman for their beautiful photos of Michigan, especially the GrandHotel on Mackinac Island. I grew up in the Upper Peninsula and crossed the bridge just once, it was frightening. I understand they had drivers who would drive your car across the high bridge. I wonder if the authors will get up tothe uppper part of the state and visit LakeSuperior, just as scary as the bridge. Northing colder than the winds from Canada calledthe “Siberian Express”in the winter. Our family joke is the quote I made years ago “I married the first man I met fromCalifornia just to get away from thecold and winds in Michigan.